Migraine brains are incredibly sensitive to all kinds of light. The light and flicker from computers, fluorescent lights, CFLS and the sun can be absolutely brutal and debilitating. Research has shown that precision-tinted FL-41 lenses can filter the types of light that cause migraineurs problems. 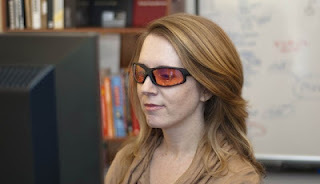 I wrote an article about this research at Migraine.com: Precision Tinted Lenses Help Reduce Migraine-Related Visual Disturbance. But until recently, it’s been difficult to find an easy, reasonably priced way to access these lenses. Enter Theraspecs.